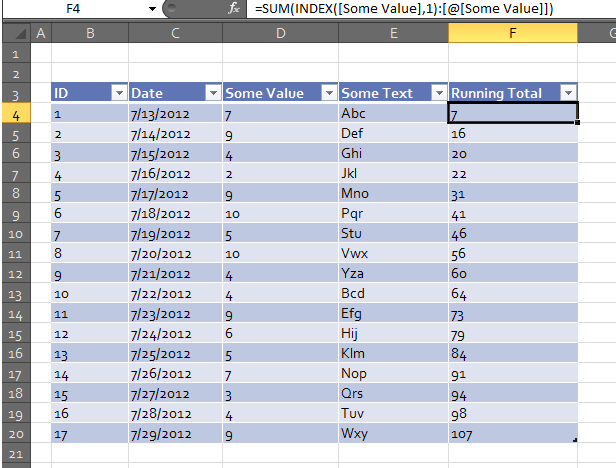 For this example I have a data set which has a few columns and rows of fictitious data. I have named my Table “tblData”. Here I am referencing the row of the header of that column, as you can see with the structured reference “[[#Headers],[ID]]”. This is useful because no matter where my Table is I will have an ID which starts at 1 and continues up in a linear increment. Notice there is no $ on the last row number reference. This leaves it relative, so when we copy it down it will increment nicely and we’ll have our running total. However, using this in a Table isn’t a good idea, as it can be fraught with problems. 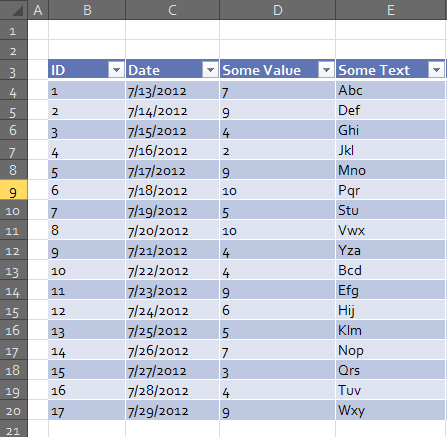 The problem is when you start adding new rows in a Table. The behavior will give you odd results, and it will not always continue your range as you would think. The bottom line is if you are using a Table, it’s always best to use structured referencing when you can. This says we will look at the range of the entire “Some Value” column, but only row 1. This will give us the first part of our formula. That’s it, you now have a running total utilizing structured referencing! Thank you for the much needed information. How about if you want to calculate a running total but it is using the same cell as the input field only?Everyday the value in the cell is changing.For example, today you enter 20 in cell H2 and the next day 30 in cell H2 again, the running total in cell I2 should now be 50.Please shed a light on this.Thank you very much. Thanks for the article. I think there is a minor typo. You wrote: “As you can see I have an ID row, “. Did you mean: “As you can see I have an ID column, “?